This dessert is kind of hard to describe. When you hear “Strawberry-Pretzel” it sounds weird, and even slightly gross, and I get that. Let me just tell you that when I was describing it to my mom, before I could even finish telling her about the middle layer of the dessert, she said, “That is my all time favorite summer dessert!,” and then she was disappointed that she couldn’t partake in eating it. I’m pretty sure that at some point in your life, you have eaten this dessert, perhaps without ever knowing what went into making it so delicious. 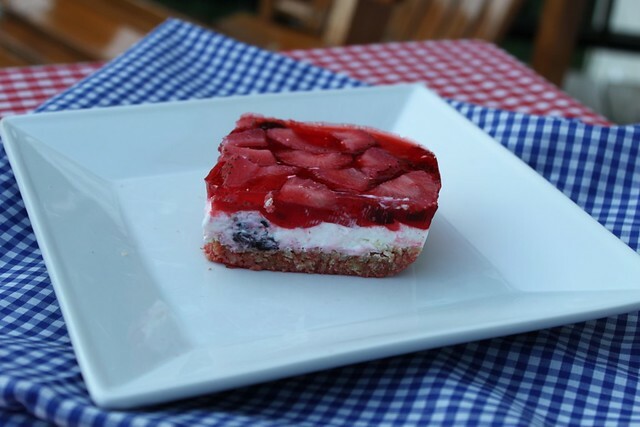 I made this for the 4th of July BBQ we had when we got back from our camping adventure and since I wanted it to be red white and blue, I added some blueberries to the cream cheese layer. Unfortunately, you could hardly see the blue, or taste the blueberries, which should only tell you that this dessert should not simply be relegated to the 4th of July – you should probably just eat it all summer, or all year for that matter. I’m sorry I didn’t get to take pictures of all the steps, but I was in kind of a hurry because I started making this without first reading the instructions carefully. This is probably the type of thing you should make the day before, or at least the morning of an evening BBQ, because jello takes a long time to set! I cut down the chilling time significantly (because I needed it ready by 7 pm), and it still turned out fine, so I have indicated this change in the recipe below. However, other than the waiting time between each layer, this was much simpler to put together than I imagined. Each layer is super easy- just mix and pour into the pan. The only baking required is the 10 minutes to set the pretzel crust. I even took the liberty of “lightening” this dessert, and it didn’t taste any different than I remember as a kid. In fact, a lot of people call this “Strawberry, Pretzel Salad”, so I’m pretty sure that means that you can eat a lot of it without feeling guilty ;-). Pretzel Layer: Preheat oven to 350°F. Mix pretzel crumbs, 1/4 cup of the sugar and all the butter. Press into bottom of 13×9-inch baking pan. Bake 10 min. Cool. Cream Cheese Layer: Beat cream cheese, remaining 1/4 cup sugar and the milk until well blended. Gently stir in whipped topping and blueberries (if using). Spread over cooled crust. Refrigerate until ready to use. 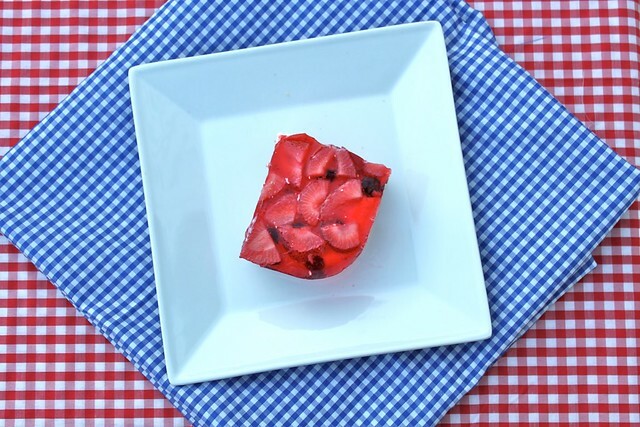 Strawberry Jello Layer: While the above layers are in the fridge, stir boiling water into dry gelatin mix in large bowl for at least 2 minutes, until completely dissolved. Stir in ice cold water (it is fine if ice cubes are still in the water, they will melt). Put bowl in the freezer for 20 minutes, then remove and stir in strawberries. Pour cool jello over the cream cheese layer, and allow to solidify in the fridge for about 3 hours. Slice in squares and serve with a fork. This entry was posted on July 9, 2011 by Spice Is Nice. It was filed under Bar Cookies, Dessert, Fourth Of July, Holiday and was tagged with Bar, Cream Cheese, Dessert, Fourth of July, Jello, Pretzel, Strawberry. Just made this dessert to take to Frank’s tonight! He invited Grandpa, Grandma, Max and me to dinner! I made a few big mistakes – but I’m sure it will taste wonderfully delicious! !